At the NCAA indoor championship meet, the women's 3000 meters turned out to be a great race. National leader Lisa Koll of Iowa State, who captured the 5k in dominant fashion, was looking to get her 2nd title in Arkansas. However, it was clear from the start that this victory was never going to come as easy as the 10-plus second romp in the 5k came for Koll on Friday. For starters, 3k is a little short for Koll, who runs the 10k outdoors. Secondly, Koll was facing much stiffer competition in a fresh Angela Bizzarri (Illinois), who of course was the NCAA cross-country champion last fall. The expected duel between Bizzarri and Koll more than lived up the billing. Villanova's Sheila Reid also gamely tried to join the fight but fell off before the victory was decided over the last lap. The pace was hot throughout the race, as Koll didn't want it to come down to a sprint. Clearly, she had right to believe she was the fittest runner in the race and she wanted to slowly grind the will out of her opponents. But Reid and Bizzarri didn't go quietly and with just over 200 to go, Bizzarri went to the lead. Was it over? No. Koll chased after and put on a game fight and tried to come back on Bizzarri after they came off the final turn, but Koll's surge came too late and Bizzarri had completed her own personal triple crown of having won three straight NCAA titles in three straight NCAA meets (5k outdoors 2009, cross-country 2009, indoor 3k). In the process of winning her first NCAA indoor title, Bizzarri had run a huge PR, as her time of 8:57.40 smashed her previous best of 9:10.16. Koll ran well also, as her 8:57.52 was very close to her 8:56.09 PR and collegiate leader. 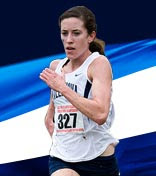 Villanova had three other finalists: Nicole Schappert joined Sheila Reid as a 3000 meter all-american, thanks to her 6th place finish. Bogdana Mimic was 12th and Ali Smith was 16th.